The Lakers will hold out Kobe Bryant and Steve Nash out of practice soon, but the reasons hardly point to any setbacks the veteran guards experienced thus far in training camp. Bryant practiced for two hours and 15 minutes of the Lakers’ three-hour practice on Tuesday, while Nash played for about 90 minutes without any limitations or setbacks. But in the interest of maximizing the health of Bryant and Nash, Lakers coach Byron Scott will sit them out of the evening portion of the team’s scheduled two-a-day session on Wednesday. Bryant and Nash will still practice on Wednesday morning. His loud voice carried across the Lakers’ practice facility. His wide smile instantly created positive energy. His playfulness instantly created laughs among teammates, coaches and reporters alike. The Lakers will begin training camp on Tuesday, hoping that a healthier Kobe Bryant and Steve Nash, Byron’s coaching staff and renewed hunger will scrub away the stench from last season’s 27-55 record, the tram’s worst record in L.A. franchise history. But when it comes toward providing colorful quotes, Nick Young already appears in mid-season form. After endlessly photobombing teammates’ interviews and playfully talking trash to them during the Lakers’ Media Day on Monday, Young opened up his interview with a heavy dose of bravado. In between countless workouts and film sessions, Julius Randle had a rare moment to himself where he could soak everything in. The Lakers drafting him seventh overall became a “dream come true.” So did teaming up with Kobe Bryant, his childhood idol. Randle had plenty of time to register it all the past three months. 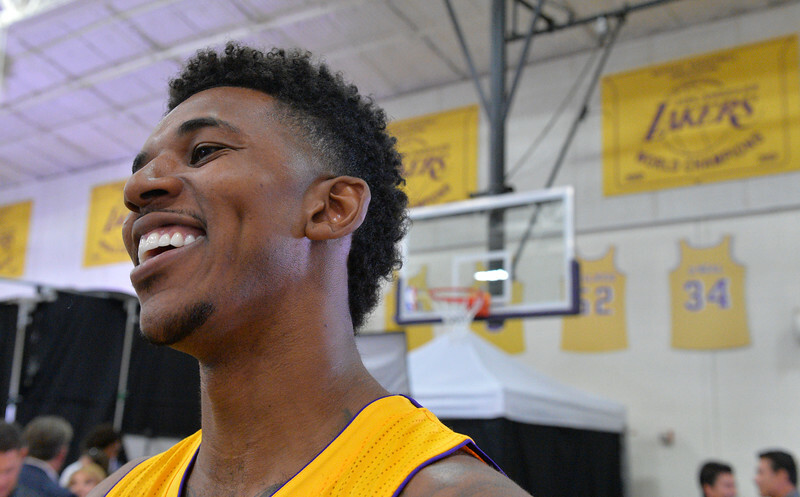 But as he put on the Lakers’ uniform for the team’s annual media day on Monday, everything struck him at once. Yet, Randle fully understands nothing becomes guaranteed in ensuring that he will always wear that purple and gold uniform laced with a “16 X” logo indicating the number of championships they won. 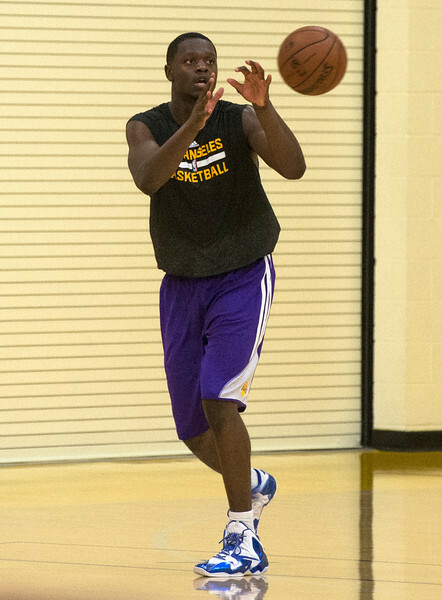 When the Lakers drafted Randle, it appeared likely he would start and arguably become the second most important player on the team behind Bryant. Since then, the Lakers acquired 12-year NBA veteran Carlos Boozer off the amnesty wire, and Lakers coach Byron Scott has indicated he currently favors him to start at power forward. Randle sounded open to the idea. 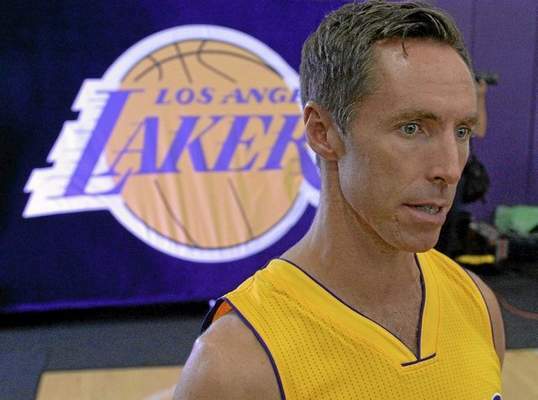 Steve Nash in better health, but how long will it last? The positive vibes lasted all summer for Steve Nash, finally able to train and play basketball without nerve root irritation flare up in his back in unexpected moments. Unlike the past two years where he missed a combined 99 games because of root damage to his back and hamstrings, Nash practiced all summer unscathed. Yet, Nash sounded well aware that his positive spirits and health may sour as quickly as one of his nifty no-look passes. 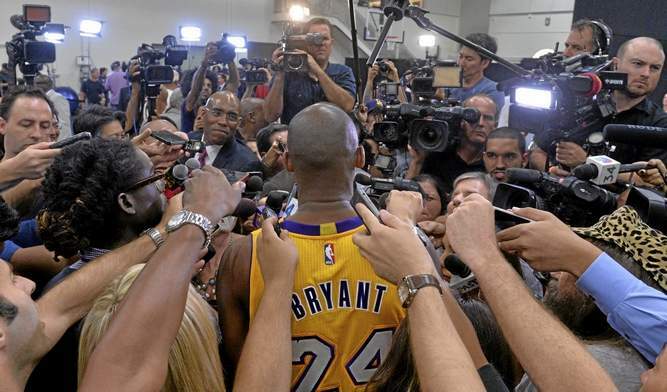 A calming presence loomed around Kobe Bryant as he walked around the Lakers’ practice court, filming endless promotional spots and answering endless questions amid a swarm of people commanding his attention and time. But as the Lakers’ 2014-15 season officially started with the team’s media day on Monday at the team’s practice facility in El Segundo, the pleasant and smiling exterior masked the more conflicted emotions Bryant felt inside. Bryant remains only a season removed from when he played only six games because of injuries to his left Achilles tendon and left knee, a stretch that coincided with the Lakers finishing with their worst record in L.A. franchise history. Hence, why Bryant had plenty on his mind. Below is the ninth in a series previewing the story lines surrounding each player on the Lakers’ roster for the 2014-15 season. 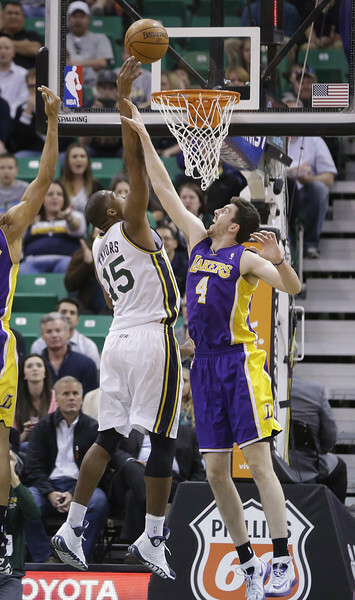 This post focuses on Lakers forward Ryan Kelly. 1. Where does Kelly fit in the Lakers’ frontcourt? It almost seems inevitable that one of the Lakers’ forwards will wind up losing in a game of musical chairs. Barring any major injuries, the Lakers will not be able to find a consistent and productive role for all of their power forwards, including Carlos Boozer, Ed Davis, Julius Randle and Kelly (playing each player 12 minutes a game would seem pretty counter productive). This left Lakers general manager Mitch Kupchak acknowledging that coach Byron Scott may resort toward playing small for a number of reasons. The Lakers do not have any player listed above seven feet, leaving Jordan Hill and Robert Sacre as the lone true centers. The Lakers’ glut of forwards could leave opportunity for someone, such as Kelly, to play at small forward. That might become a reality for Kelly given his strong outside shooting and floor spacing. But that creates a whole other list of challenges. He would then compete for minutes against Nick Young, Wesley Johnson and Xavier Henry, all of whom may also see some time at shooting guard. Regardless of how this plays out, it seems clear that Kelly enters the 2014-15 season with a number of unpredictable variables that could determine his role. Given Kelly’s professional and hard-working personality, it appears he will understand such issues. But it creates an additional challenge that Kelly must master. In exactly one day, Steve Nash and Jeremy Lin will have more clarity on how their common experiences could shape them into having a fruitful partnership. Both entered the NBA as underdogs. Both thrived under former Lakers coach Mike D’Antoni in separate stints of their career. Both have something to prove this season. And as the video above shows, both have an incredible sense of humor. Nash made a cameo appearance in Lin’s latest parody video that mostly entails his friends pressuring him to take advantage of the Hollywood spotlight and appear in various commercials. The end of the video then features Lin concluding he would rather concentrate on basketball, leading his two friends to argue over who can emulate Nash and Bryant to help Lin prepare for the season. But just as they settle on which Lakers stars they will emulate, Nash makes a surprise appearance and takes over to help Lin. This marks the second time Nash and Lin teamed up together on a parody video, appearing last year in a spoof that poked fun on how Lin’s personality changed through “Linsanity.” Perhaps this marks the beginning of a fruitful on-court partnership. Below is the eighth in a series previewing the story lines surrounding each player on the Lakers’ roster for the 2014-15 season. This post focuses on Lakers forward Ed Davis. 1. Where will Ed Davis fit in the Lakers’ frontcourt? Following the health of Kobe Bryant and Steve Nash, the second biggest storyline coming out of Lakers’ training camp will entail positional battles. Though Lakers coach Byron Scott said every starting spot outside of Bryant’s position will become up for grabs, it appears the forward spot seems the most unpredictable because of the number of possible candidates. Carlos Boozer is considered the favorite because of his experience, while rookie Julius Randle is expected to have chances to develop as a highly touted rookie. So where does that leave Davis? Will his strong defensive credentials overshadow Boozer’s defensive concerns? Will Davis’ relative experience over Randle still give him an advantage? 2. Can Davis overcome potentially inconsistent playing time? Scott has stressed that his players will have to earn their playing time. But it’s still fair to point out that Davis’ success could hinge on how many minutes he plays. Consider the difference between Davis posting a career-high 9.7 points and 6.7 rebounds in 24.9 minutes per game in the 2012-13 season and finishing last season averaging only 5.7 points and 4.1 rebounds in 15.2 minutes. Of course, output usually increases with more opportunities. But as Bleacher Report recently noted, Davis has represented one of seven players to average at least 13 points on 53 percent shooting, 9.5 rebounds and 1.5 blocks per 36 minutes. Simply put, plenty of Davis’ struggles simply points to a lack of opportunity, including playing in Memphis behind a loaded frontcourt that included Marc Gasol and Zach Randolph. Davis could encounter similar issues considering the Lakers have a frontcourt featuring Boozer, Randle, Jordan Hill, Robert Sacre and Ryan Kelly. This situation puts the onus both on Davis to establish a niche despite possibly limited opportunities and for Scott to put Davis in a position to succeed. Julius Randle will encounter an opponent far more difficult to beat than a bruising big man in the paint. He will still push even if the effort proves more challenging than anything he encounters his rookie season with the Lakers. Randle will relish this experience despite the complicated schedule providing a sneak preview on what the NBA’s grinding 82-game season entails. This weekend, Randle is hosting a three-on-three basketball tournament at his alma mater, Prestonwood Christian Academy, near Dallas, Texas to raise funds for the TeamConnor Childhood Cancer Foundation. The $200 registration fee for each team will go toward the foundation’s efforts in providing funds for research and treatment surrounding childhood cancer. Randle will then immediately fly back to Los Angeles for the Lakers’ Media Day on Monday at the team’s practice facility in El Segundo. This initiative taps into Randle’s hope to use his NBA basketball career as a launching pad toward helping those in need. But this particular issue also hits Randle closely. In 2009, one of Randle’s young Prestonwood classmates named Connor Cruse died because of neuroblastoma cancer. 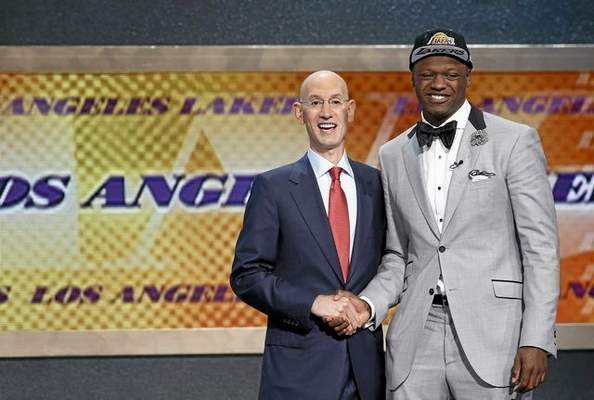 The Lakers made the first major step in their rebuilding process when they used their seventh overall draft pick to select Julius Randle, a 19-year-old bruising forward that already has the talent and work ethic to have a long-term future here. But Lakers general manager Mitch Kupchak stepped his foot on the brakes in assessing what impact Randle can make his rookie season. In a wide-ranging press conference on Friday at the Lakers’ practice facility in El Segundo, Kupchak anticipated Randle initially driving through some speed bumps.